A well deserved holiday (at least that’s what I think), and we’ll be off to London soon, to return by the end of next week. 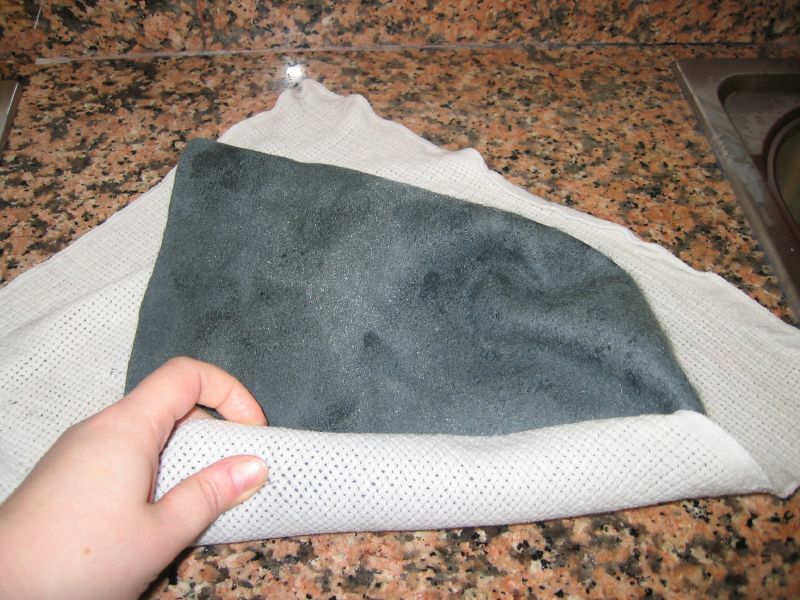 I will have some fun and promise to take pictures of any hatty stuff that I find. Once back I will get back to blogging more regularly, I promise! And down Rambla Catalunya we walked… with our hats on! As always we failed in the “spreading the word” part, and this year, like last year, we have promised ourselves that next time we will publicize the event as it deserves. Having said that, it was fun, and they cannot take that away from us! And at last I got a chance to show off my Catherinettes hat. Click on the picture to see the whole set of pictures. 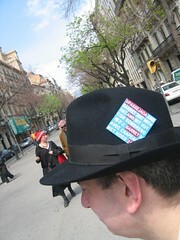 Strolling down Rambla Catalunya with our hats on… come join us! Will you be there? 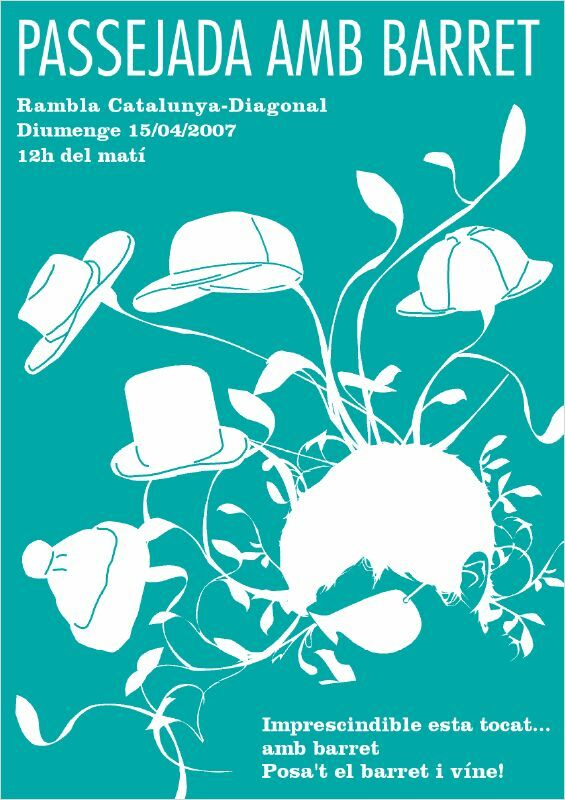 If you’re anywhere near Barcelona on Sunday 15th April 2007 at noon you should drop by Rambla Catalunya (where it meets Diagonal Avenue) because it will be there that we will start our “Annual Hatted Stroll”. Nothing as massive as an Easter Parade (check two wonderful pictures from the NY Easter Parade posted on 9 April in the Satorialist blog), quite the contrary on this Barcelona stroll it’s just a bunch of friends (no more than 50 perhaps) that decide to take a walk together… with our hats on. The beautiful poster on the left is the one that’s been made (don’t know by whom!) for the occasion. For those curious it’s written in Catalan, the regional language. Anyone is welcome. I hope to see you there! 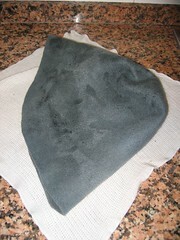 First of all the felt is turned inside out and sprayed with plain water. I then put it on a wet cloth and roll it up. It goes 2 minutes at maximum in the microwave. 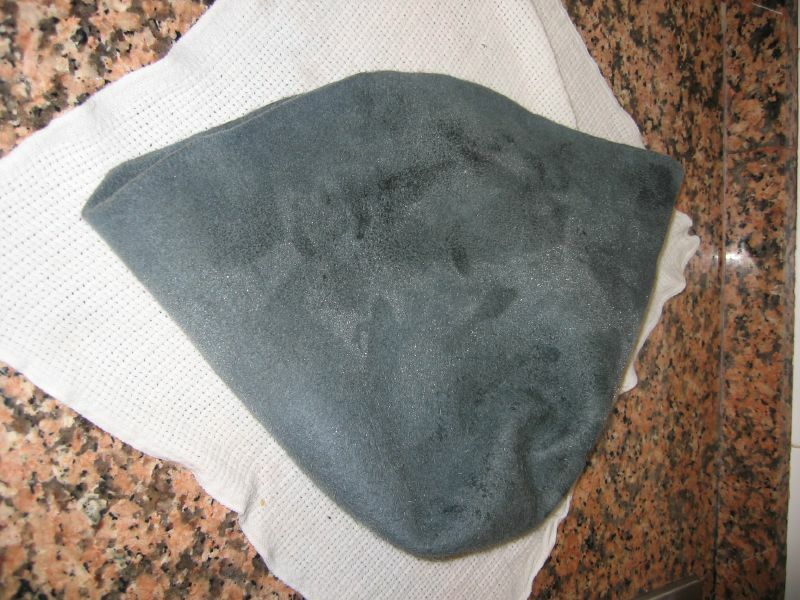 Then I brush the sizing on and it goes back, rolled, into the microwave for another couple of minutes… please be careful to size evenly, because this time I had a couple of weak spots (discovered upon taking the hat out of the block). I finally started on the hat. First I want to let you take a look at the hat block. 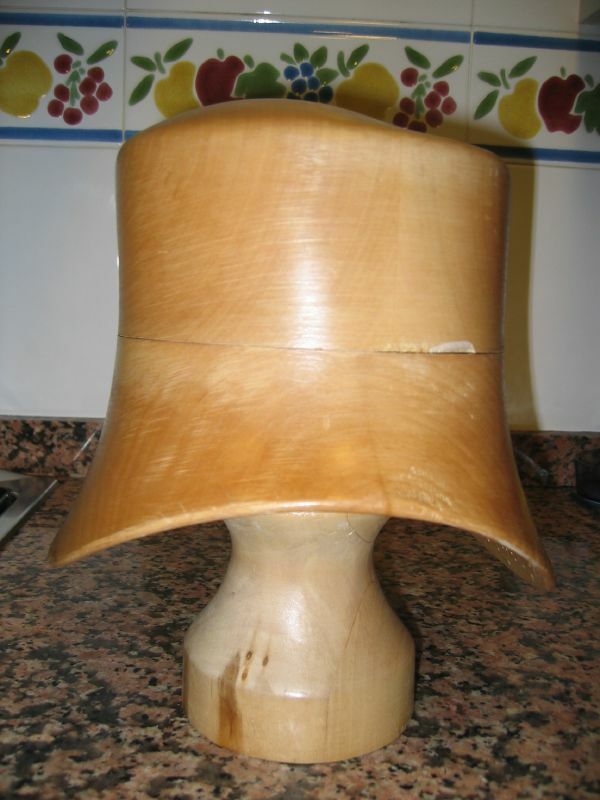 It’s the most beautiful i have, it’s like a sculpture made of wood. It’s made by Fratelli Bini in Florence. I saw it on their website, contacted them and ordered it (that was years ago). I’ve just checked their website and it upsets me to see that they are not taking orders although there is a 2007 collection. You can see their collections if you follow this link. 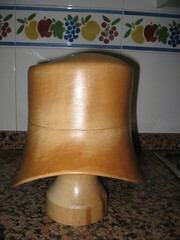 You can also look at the hat features. In case you missed it, here is the link to Jill’s post about the 3 minute millinery video on how to make a silk hat. She discovered it in You Tube, which promises to be another treasure trove for the hat loving community. The video shows the entire process of making a beautiful pattern hat out of silk cloth, it’s been edited at a fast pace with nice background piano music, you will enjoy it! Last week was a good week. On Wednesday, after work, I went to visit my friend Nina at the Escola Massana, an Arts and Design school well known in Barcelona. She is giving a millinery course there, every Wednesday from 4 to 8 pm. It was really exciting to be there and to meet the students. 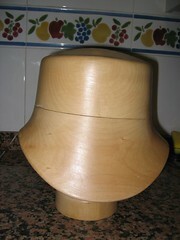 Every student makes their own design, their own hat blocks out of cork and finally the hat. 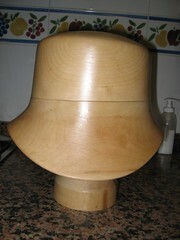 Next time I go there I will take some pictures of the process of hat block making for you to see. I also enjoyed helping some of the students (Nina has proposed to me that I substitute her occasionally on the class… but that is a scary prospect!). While I was there Nina asked me if I could help her by making a hat that she needed for her current project and I said noooo way! too much going on (well not really), but I didn’t want that kind of responsability on my shoulders. Then she asked if I could go to her workroom on Sunday to give her a hand, to which I said YES!!! I really love to go there, and the hours just seem to fly while I’m helping her with one thing or the other. 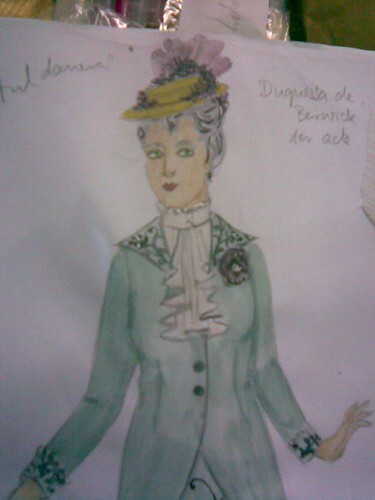 Nina’s current project are the clothes and accessories for Oscar Wilde’s play “Lady Windemere’s Fan”, that is opening on the 19th of April at the Catalan National Theater (it’s played in Catalan, the language of this region). Although she has designed the whole lot she’s only making the hats and accessories herself, the rest is being made based on her designs.